Cairo, 17 April 2019: – The African Export-Import Bank (Afreximbank) has been awarded the mandate to serve as the exclusive financial adviser and mandated lead arranger for the $130-million bauxite mine expansion project by Sierra Mineral Holdings 1 Limited (Vimetco) in Sierra Leone. 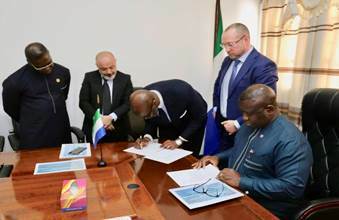 The mandate was announced in Freetown on 4 April during a working meeting hosted by Sierra Leonean President Julius Maada Bio with representatives of Vimetco, the chief sponsor of the project; VI Holdings, the parent company of Vimetco; and Afreximbank. Under the terms of the mandate, as captured in an engagement letter signed between Vimetco and Afreximbank during the working meeting with President Bio, Afreximbank is given the authority to provide financial advice and to take the lead in arranging the raising of capital for the project. The signing ceremony also marked the official launch of the expansion project, which will see the construction of a new plant commencing in 2020, with production scheduled to start in mid-2022. The Vimetco bauxite mine will produce aluminium and alumina tri-hydrate which is used in the refractory and ceramics industries and for water purification. Other uses of alumina tri-hydrate include as a flame retardant filler and as a polishing compound. The construction of the new plant equipped with modern technology will mark a first in Sierra Leone in terms of the development of the mining industry. The project will create jobs and lead to development of infrastructure through the construction of schools, hospitals, roads, bridges, etc. Vimetco currently employs more than 1,500 people and contributes 1 per cent of its revenue to community and social development projects, including orphanages, schools and major social events. The company is a globally integrated aluminium group and operates bauxite mines in Sierra Leone, coal mines, aluminium production and processing facilities and electricity plant in China and an alumina refinery and aluminium smelter in Romania. Also participating in the working meeting were David J. Francis, Chief Minister of Sierra Leone; Igor Higer, Executive Representative, VI Holdings; Alex Ivanov, Managing Director, Vimetco; and Ibrahim Sagna, Director and Global Head, Advisory and Capital Markets, Afreximbank. Others were Basudeb Datta, Director of Operations, Vimetco; Abdul Bangura, Chief Finance Officer, Vimetco; Abdoulaye Kone, Regional Chief Operating Officer, Anglophone West Africa, Afreximbank; Pete Olowononi, of the Afreximbank Regional Office for Anglophone West Africa; and Kingsley Mbah of Afreximbank’s Advisory and Capital Markets Department.